Ready in just 10 minutes these green beans are sure to become a favorite you’ll make again and again. I don’t know about you but here at my house I tend to get in a rut when it comes to side dishes. That’s why I’m always on the look for something different. If you’ve got a great side dish you can make even a simple dinner something special. 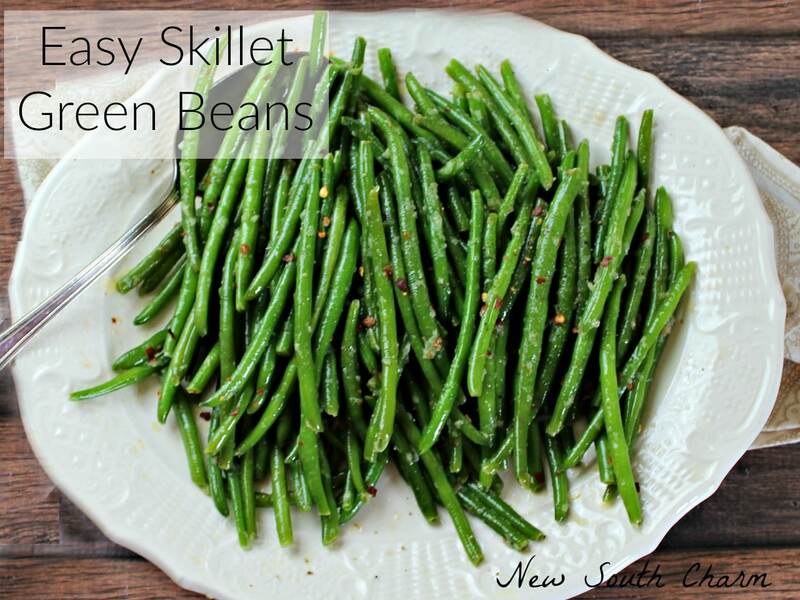 We really liked these Easy Skillet Green Beans they had good flavor. The red pepper flakes gave them a little bit of kick. Plus it didn’t hurt that they were super easy to make. Heat the olive oil in a large skillet over medium hight heat. Once oil is warm sprinkle in red pepper flakes and stir to coat. Then add in green beans and cook for five minutes, stirring occasionally. At the end of five minutes add garlic, salt and pepper and stir to combine. Then pour in four tablespoons of water and toss green beans around few times. Reduce heat and cover cooking for five minutes. Serve immediately. If you read my Bacon and Scallion Chicken Salad post then you might remember that I’m learning to cut back on carbohydrates. This is a low carb recipe. 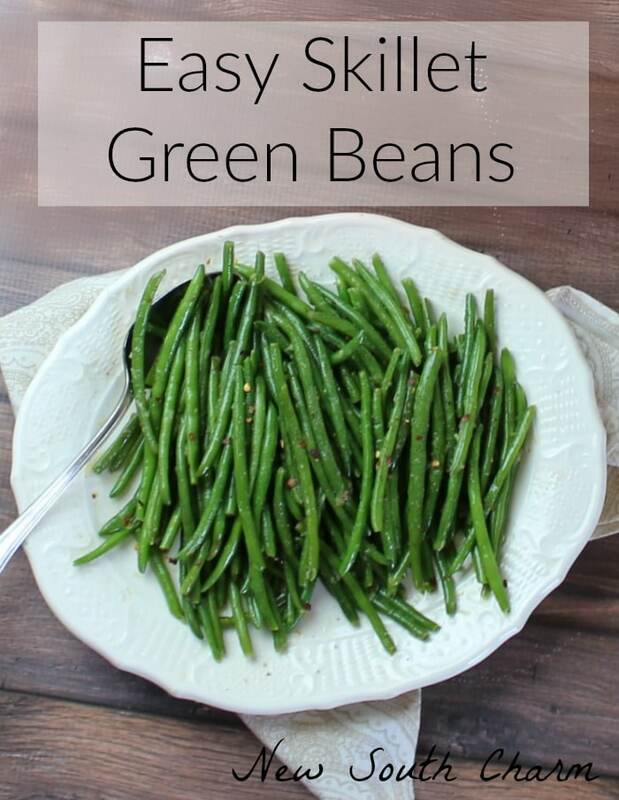 So if you are like me and trying to lost a little weight, or just trying to eat a little healthier then you’re going to love these green beans. Looking for more green bean recipes? …or how about these great side dishes? In a large skillet heat olive oil over medium high heat. Sprinkle in red pepper flakes and stir to coat. Add green beans to skillet and cook for five minutes, stirring occasionally. Pour in water, garlic, salt and pepper toss together. Reduce heat and cover, cook for five minutes. Yum!!! We are always on the lookout for a good green bean recipe and this one sounds perfect! I love having fresh produce to cook with. I’ve never grown green beans. That’s something I might think about next summer. I’d love to pop by Friday! Thanks for the invite. 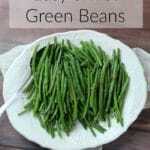 I love fresh green beans and this recipe looks awesome! Thanks so much for sharing with Full Plate Thursday this week. Hope you are having a great day and come back to see us real soon! I love the summer when you can get fresh produce so easily. These green beans are great and so easy to make. They are fantastic! I’m always looking for easy, healthy side dishes to help make dinner great.